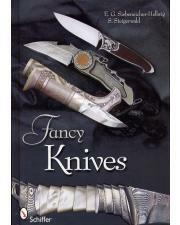 Fancy Knives has more than 290 color pictures and offers insights into the materials used in making knives, their qualities, and various working and decorating techniques. Specialists form individual fields of non-machine-made knife making tell of their handiwork. A special chapter gives the reader instructions for making his own knife. Included is also valuable information about steel, knife blades, handle materials, decorative techniques, making sheaths and purchase and care. Stefan Steigerwald, ranks among Germany's best-known knife makers. Ernst Siebeneicher-Hellwig, teaches knife making courses and is an instructor at the Bavarian Hunting School.